In a decade, high speed travel via outer space will represent an annual market of at least $20 billion and compete with long-distance airline flights, UBS says. UBS expects the broader space industry, which is worth about $400 billion today, will double to $805 billion by 2030. Long haul airplane flights that are more than 10 hours in duration would "be cannibalized" by point-to-point flights on rockets, UBS said. UBS believes there will be very lucrative ramifications from the space flight efforts currently led by Virgin Galactic, SpaceX and Blue Origin. A lengthy UBS report published on Sunday found that, in a decade, high speed travel via outer space will represent an annual market of at least $20 billion and compete with long-distance airline flights. Space tourism will be a $3 billion market by 2030, UBS estimates. "While space tourism is still at a nascent phase, we think that as technology becomes proven, and the cost falls due to technology and competition, space tourism will become more mainstream," UBS analysts Jarrod Castle and Myles Walton wrote in the note. "Space tourism could be the stepping stone for the development of long-haul travel on earth serviced by space." UBS expects the broader space industry, which is worth about $400 billion today, will double to $805 billion by 2030 when accounting for these innovations. While these sub-sectors would be a small part of that, Castle and Walton said "the outlook for the space economy, space tourism and long-haul travel using space has become much more bullish." Private space companies "are investing aggressively across the space opportunity," UBS said, and the firm believes access to space "is the enabler to broader opportunities for investment." Long haul airplane flights that are more than 10 hours in duration would "be cannibalized" by point-to-point flights on rockets, UBS said. The firm pointed to SpaceX's plans to use the massive Starship rocket it is building to fly as many as 100 people around the world in minutes. SpaceX said that Starship would be able to fly from New York to Shanghai in 39 minutes, rather than the 15 hours it takes currently by airplane. A rendering of SpaceX's Big Falcon Rocket (BFR). UBS estimates that there are more than 150 million passengers a year that fly routes longer than 10 hours. Last year, those routes saw 527,000 routes on airplane that had an average of 309 seats, UBS said. "Although some might view the potential to use space to service the long-haul travel market as science fiction, we think ... there is a large market," UBS said. UBS noted that "it is unlikely that a rocket will carry over 300 people anytime soon," so the Starship's capacity of 100 will be the maximum for the foreseeable future. However, UBS believes there may be an "increased frequency of space travel during the day to enable the same volume of passengers," the firm said. "Given the length of long-haul commercial travel, and the rules around crewing and take-off and landing time slot restrictions at airports, we think a re-usable rocket (especially if not land-based) would have materially better utilisation rates than a commercial plane," UBS said. As a result, UBS believes the $20 billion estimate "could prove conservative," the firm said. More than 10 percent of people in a recent UBS survey said they would choose a spacecraft over an aircraft for long distance travel. "While the timing of such a long haul service is uncertain, we think our base-case assumptions are conservative," UBS said. The billions of dollars pouring into private space companies represents "a high level" of capital formation, UBS said. Even though space tourism "is still nascent," UBS said they believe the sub-sector "will become mainstream as the technology becomes proven and cost falls." To date, space tourism has largely been limited to the few flights organized by U.S.-based Space Adventures. Over the past two decades, the company has flown seven tourists using Russian Soyuz rockets. At a reported cost of more than $20 million per person, the private clients typically spent over a week on board the International Space Station. But now "there are a number of commercial space ventures to open up suborbital travel," UBS noted. Virgin Galactic and Blue Origin are leading those efforts, both getting steadily closer to launching paying tourists. "This area seems to be the market that has the greatest potential to gain traction quickly," UBS said. Virgin Galactic is deep into the development program of its spacecraft. Last month, the space venture owned by Sir Richard Branson sent test passenger Beth Moses on Virgin Galactic's spaceflight – a first for a private U.S. company. Virgin Galactic's spacecraft holds up to six passengers along with the two pilots. As the company has more than 600 would-be astronauts signed on to launch, Moses' work is key to preparing Virgin Galactic for commercial operations. Tickets for Virgin Galactic's flights are priced at $250,000 each. UBS believes Virgin Galactic's business model, as both a tourism company and manufacturer of spaceships, mimics the growth of businesses in the early days of aviation. "In this way history could repeat itself as United Airlines today can trace back its roots to the Boeing Aircraft & Transport Company," UBS said. Blue Origin, the company founded by Amazon CEO Jeff Bezos, is also nearing its first spaceflights with human passengers. Blue Origin is developing the New Shepard rocket system for the company's space tourism business. As both Virgin Galactic and Blue Origin utilize reusable spacecraft systems, UBS believes the companies will be able to make space tourism "a more common occurrence" as reliability increases and prices decline. "We estimate space tourism will be a $3 [billion plus per year] opportunity growing at double digit-rates," UBS said. 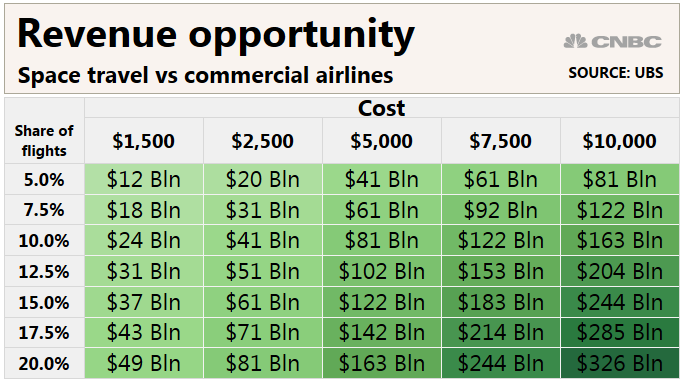 "This would be similar to what happened in commercial aviation, especially after the rise of low-cost airlines." SpaceX could also see significant cash flow from space tourism, UBS believes, through two different ventures. Elon Musk's company just completed a historic test flight of its Crew Dragon capsule, which will be able to send as many as four astronauts to the space station. UBS estimates that NASA will pay SpaceX about $58 million on average per astronaut, compared to the $81 million per astronaut for flights on Russian Soyuz rockets. The second SpaceX opportunity is for early flights of Starship to send tourists on missions beyond the Earth's immediate orbit. In September, Musk announced Japanese billionaire Yusaku Maezawa signed with SpaceX to fly around the moon on Starship. Maezawa expects to fly in 2023, with six to eight guests joining him for the flight.